Have you ever wondered what Pinkys eat for lunch? Here is a sneak peak of lunch time at Pinky Street. 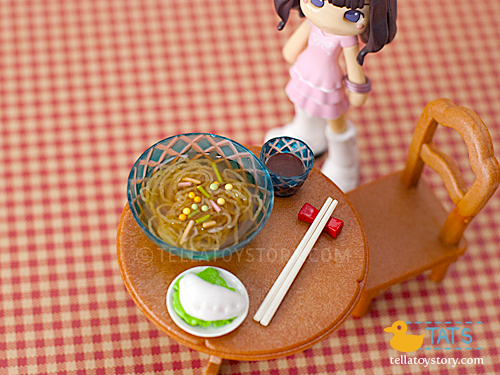 Maki San checks out her delicious lunch spread on the table. 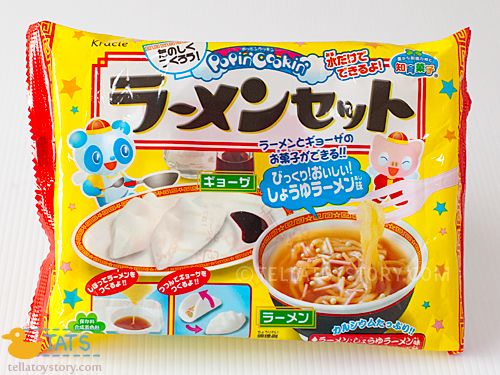 She is having ramen and dumpling, both of which are edible and made from popular Japanese series of edible gummy (grape flavored jello/gummy/soft candy) kit: Kracie Popin’ Cookin’ Ramen Set. The product do not contain artificial colours and the gummies are candy flavoured. When the dumpling is cut in two, you can see the filling inside. Even the ramen is individually stranded and comes complete with edible topping and soup broth. The feast was whipped up by Chef Mayura who is an expert at making dim sum. 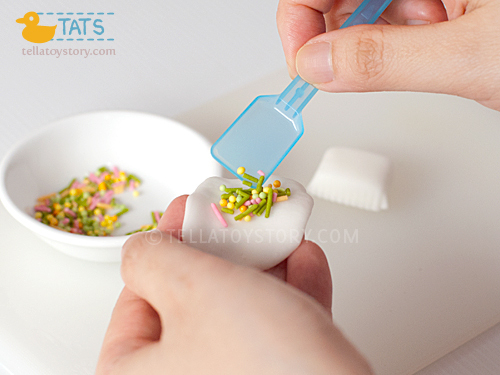 (Behind the scenes; at the kitchen): Mayura chan makes the best dim sum on Pinky Street! 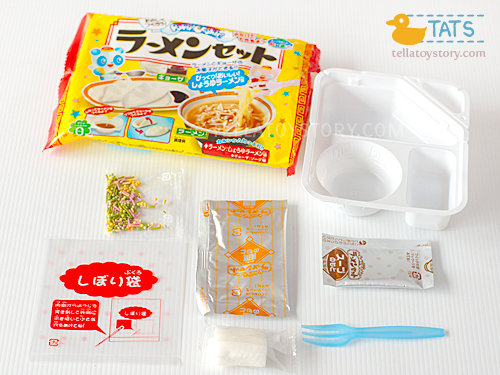 Ramen Set unboxed – you get a plastic mould, sprinklers, a small plastic bag, two sachets of gummy powder, a piece of dough for the gyoza skin, a plastic fork and a toothpick (not shown). Check out this awesome video by RRCherrypie for making instructions. Pleat the dumpling edges together to form a neat pouch. Or use the back of the fork to form pleats (my preferred method as the dough is quite sticky). You can make dumplings of various sizes and appearance. 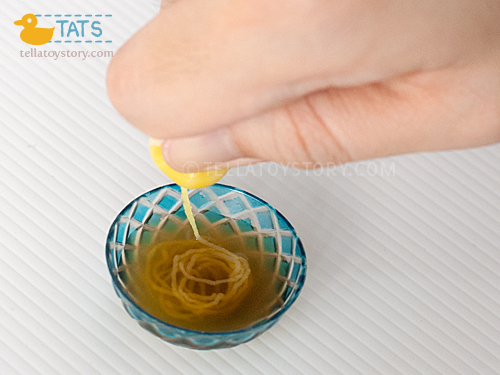 This is the concept for making the ramen but since our bowl used in the photo shoot is small, we use a needle for the hole (instead of toothpick) so that the ramen has thinner strands. 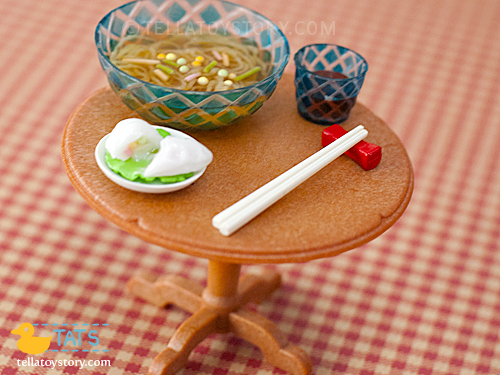 Actual size of the ramen made with the Kracie ramen kit. By the way, the broth do taste realistically soy-flavoured. Featuring Maki from PK013 (Pinky:st Series 5) wearing clothes and boots from PK014. Table and chair from Sylvanian Families’ Cottage Kitchen Set. 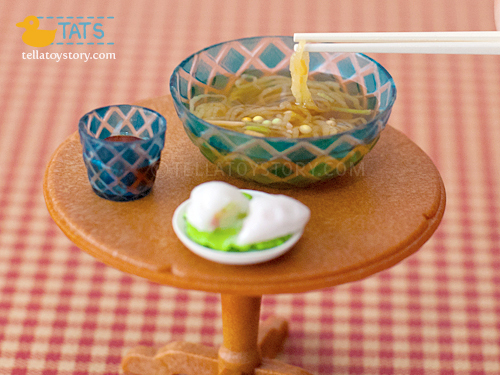 Ramen bowl, drink, chopsticks, plate and lettuce from my miniature food collection. 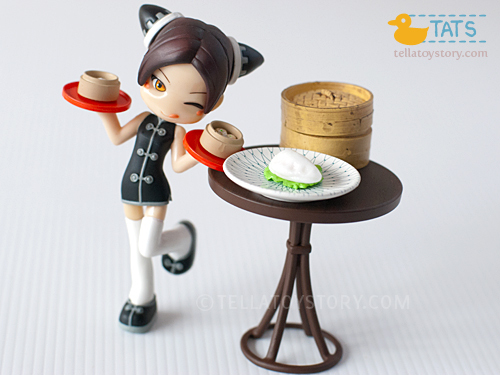 Featuring Special Pinky-Murata Collaboration Edition – Dim Sum girl named Maruya wearing a short cheongsum and carrying two bamboo steamers of freshly made dim sum. I got this pinky for a steal at S$5 at Taka toys fair. The table is from Professor Layton Revoltech set. The bigger bamboo steamer basket, plate and lettuce from my miniature food collection. You can find it in Asian grocery shops.